Common but relatively minor side effects of Pravastatin (Pravachol) include stuffy nose, headache, heartburn and gas. More serious but rarer Pravastatin side effects include muscle pain, loss of appetite and yellowness of skin or eyes. 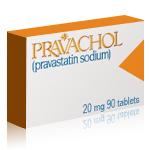 In extremely rare cases Pravachol may cause memory loss or a condition that can lead to kidney failure. The most common of these side effects include upset stomach, cold symptoms, headache and diarrhea. Amongst the least common of these Pravastatin side effects are flu symptoms, heartburn and gas. All of the listed common side effects of Pravastatin are relatively minor and either don’t require treatment or can easily be treated by the patient or a doctor. In very rare cases pravastatin causes rhabdomyolysis, a severe disorder that results in skeletal muscle breakdown, which in turn can lead to kidney failure. Symptoms include muscle pain and weakness, fever and dark urine. A patient experiencing any of these symptoms should therefore call a doctor right away. Patients with certain conditions may be at greater risk of side effects. Before starting Pravachol, patients should tell their doctor if they have a history of liver disease or kidney disease or have diabetes or a thyroid disorder. Patients should also inform the doctor if they drink more than two alcoholic beverages a day. This is because alcohol can raise triglyceride levels and may increase a Pravachol user’s risk for liver damage. Under certain circumstances, the drug cannot be taken at all. Patients who are allergic to pravastatin, have liver disease or are pregnant or breastfeeding should not take Pravachol. Memory loss is an extremely rare side effect of Pravastatin. In fact it is so rare that it is difficult to tell if the amnesia is actually caused by Pravastatin or something else. This is also the case with ‘statin’ medicines other than pravastatin. If a patient is concerned about the possibility of memory loss whilst on Pravachol , he or she should discuss these concerns with a doctor before starting the drug. Patients who notice any memory loss while taking Pravachol should talk to their healthcare provider. He or she may recommend an adjustment in the dosage or changing to a different cholesterol medication. The majority of Pravastatin users tolerate the drug quite well, experiencing no side effects. However, as with all other medicines, some patients will develop Pravastatin side effects. Therefore it is important to be vigilant for symptoms of pravastatin side effects. Contact a doctor if minor side effects become bothersome or persistent or if serious side effects develop. As with all medication, Pravastatin should always be taken as prescribed by a doctor to minimize risks.